This evening Megan and I built a dollhouse. 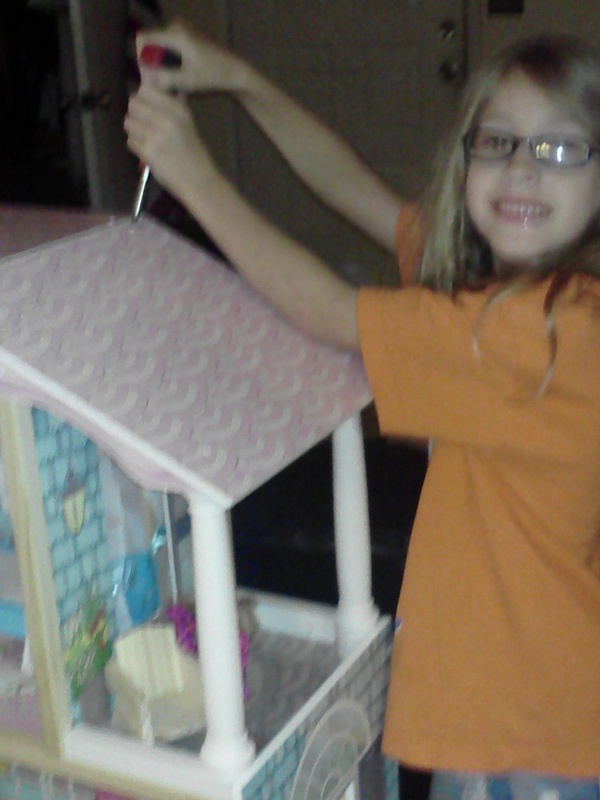 Yes, this dollhouse was so easy to build that Megan and I did it together. Okay, I did most of the work and she helped along the way…But it really was a very easy construction process. 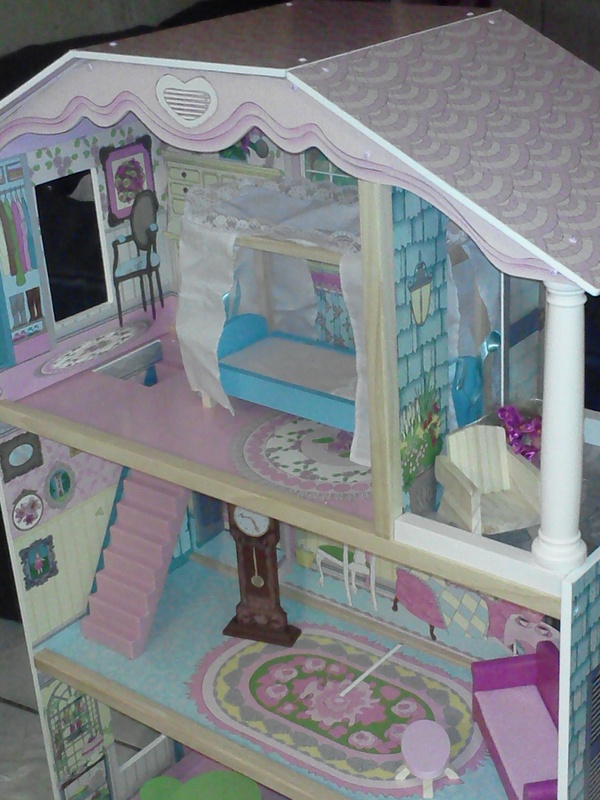 The dollhouse in question is My Delightful Dollhouse made by Kidcraft. I am really impressed with this dollhouse so far. It is very well made and they even went so far as to color-coordinate the screw heads with the wall panel colors.It stands about 4 feet tall (or 7 and half of Megan’s feet she says LOL) and about 2 and half feet wide. Included in the box were 9 pieces of furniture, a canopy bed, grandfather clock, couch, bathtub, coffee table, porch chair, table and 2 stools. Just enough to get her dolls all set up in their first home. The only problem I had with construction, which wasn’t a true “problem” per se, was with the stairs. The screws were a little difficult to get started by myself because of the way it fits into the house. Not difficult enough to be overly frustrating, just took a few seconds longer to do this step. This company is go great that they even included a kit to secure it to the wall. It is a heavily constructed toy, so securing it to the wall is important if you have smaller children. Since both of my girls are older, I am not overly worried about them pulling it on top of themselves. But do not take any chances with younger kids. It is always better to be safe. 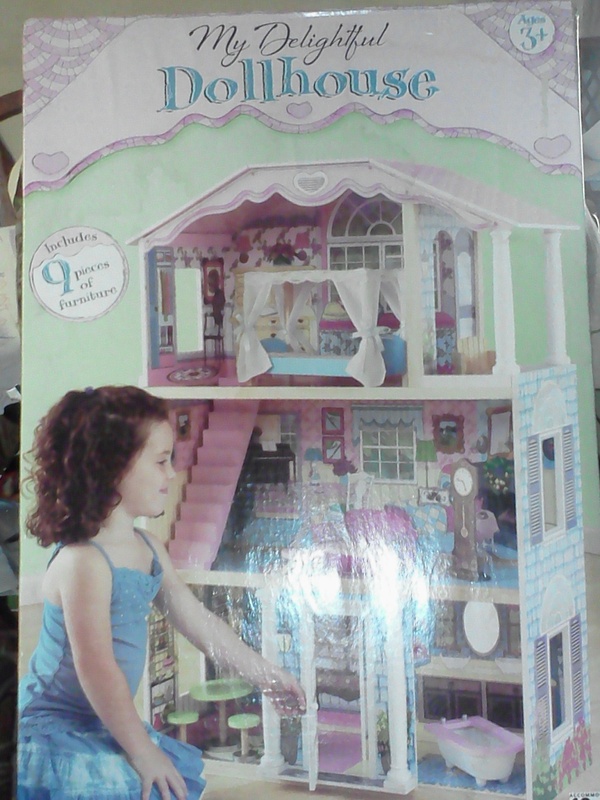 If you are looking for a long lasting , sturdy dollhouse. You will really be impressed with this one. I expect that both of the girls will be playing with this one for a long time to come.